Now that Autumn is underway, it's time to get cracking on the sock knitting, so that I can have nice toasty feet this winter. 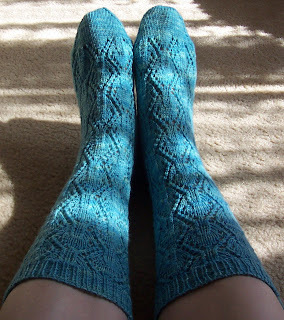 Luckily, I recently finished this pair, right in time for the cold rainy weather of the season. 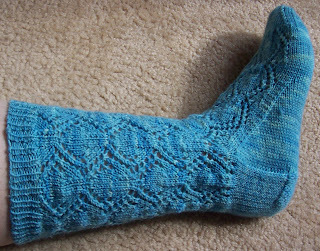 These are probably the most difficult pair of lace socks that I've knitted so far, but are definitely worth it. This pattern definitely required a lot of concentration, and the heel, whereas it is extremely durable, hurt my wrists so much to knit, with slipped stitches on both the knit and the purl sides. All in all though, these socks are gorgeous, and are definitely worth all the hard work. I'll probably knit this pattern again, but not for a while yet. Too many other gorgeous sock patterns to try.